These cards are an expansion to Bohnanza - you must have the original game to use them. The expansion set expands the number of players from 3 to 5 to 3 to 7, thus more can learn the joys of planting and growing beans. With 3 players: Remove the Cocoa beans and set them aside. Each player starts the game with a third beanfield at no extra charge. The game ends when the deck is exhausted for the second time, not the third time. With 4 players or 5 players: Remove the Coffee beans and set them aside. With 6 or 7 players: Remove the Cocoa beans and Garden beans and set them aside. The first player starts the game with 3 cards in his hand, the player on his left has 4 cards, the next player has 5 cards, and the rest have 6 cards. In the fourth action "Draw new cards", each player draws 4 rather than 3 new cards. A third beanfield costs 2 coins rather than 3 coins. 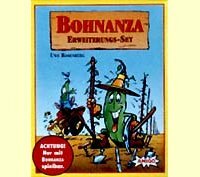 Other products in the "Bohnanza" series.